Jessie and her brother Gavin lived in a small village. 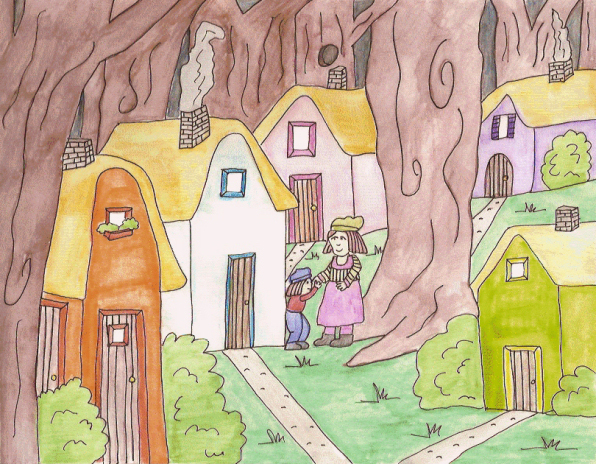 Each house was painted a different color and giant trees surrounded the clearing where the homes were built. Jessie and Gavin lived in the pink house with their mother and father and Grandma Innes. Every morning Jessie and Gavin woke up early and went into the forest to gather mushrooms, nuts and berries. Their mother spun wool and she always had her eye out for brightly colored flowers. Their father, a woodsman, left after breakfast to go into the forest and search for different types of trees that he thought he could sell. They raised chickens and geese. “It's not just a stone; it's a magic stone. I've kept it hidden all these years, waiting for you to grow up. Now that you're twelve, I think you're ready to learn about the magic.” Grandma slid the black and white mottled stone into Jessie's hand. “What does it do, Grandma? It looks quite ordinary.” Jessie held it closer for a better look. “What good will that do? How long do I have to wait? What will happen?” Jessie rambled on with questions. “Just do as I ask. You'll find out soon enough. Be sure and go alone. Don't take Gavin with you or let him follow you.” Grandma smiled and closed her eyes. Taking that as a sign of dismissal, Jessie tiptoed from the room, closing the door behind her. She put the stone in her pocket, crept down the stairs so Gavin wouldn't hear her and went outside. She stood near the front door looking over at Gretta's house. The purple house looked quiet and empty. “Maybe Gretta's gone for a picnic with her mother.” Jessie ran behind Gretta's house and looked for the old oak tree. She saw it and walked towards it. The root poked out of the ground, just like her grandma had said. She put the stone on top of it and stepped back. “Wait, what's your name?” Jessie picked up the sparkling green gem. “I'm Rainbow Applecore. I'm an elf and I live under this tree. I've lived there for a hundred years now.” He adjusted the hat on top of his head. “He gave me an emerald. I think it's worth a lot of money. Did he give you any?” Jessie sat on her grandma's bed. That night Grandma Innes passed away. Jessie's father buried her behind the house and marked the grave with a cross. That very day Jessie went to town and bought her father a new axe and her mother a new dress. She also bought Gavin a lollipop to lick all day and herself a loaf of hot bread. She went to the shops and picked up a basket of food. The shopkeepers were happy to be paid with emeralds. When her family asked how she bought the gifts she told them Grandma Innes had left her something and she used it to buy them things. She also promised that every day she'd go shopping and they'd never have to eat mushrooms and berries and nuts again. Jessie had Gavin help her gather toadstools. “We can't eat them, but I want to give them as a gift to someone,” Jessie said. She went to the old oak tree and put the toadstools and another stone there. She stepped back and two elves came out. Rainbow Applecore and a girl elf, wearing a pink dress with pointed pink slippers. “Who are you?” Jessie sat in the grass. “I'm Lily Cornflower. I live here now with Rainbow.” The girl elf took the toadstools and Rainbow Applecore took the stone. They left an emerald and then went back under the root, hand in hand.